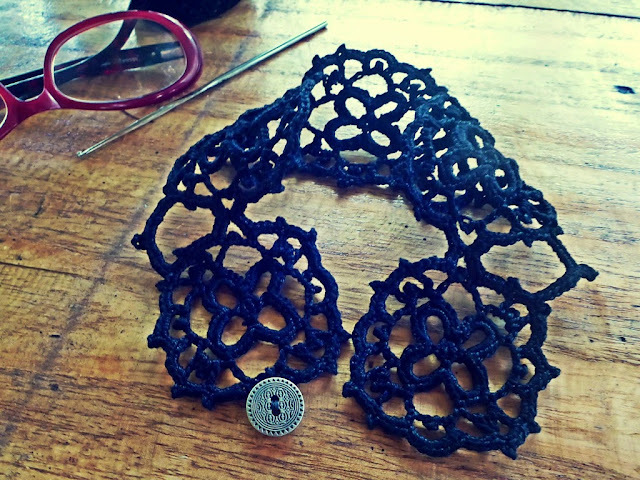 I wanted a choker – a small piece of crocheted jewellery – that was durable, rigid, and will not fold over and crumple when being worn. This choker will not need starching to make it stiff, but starching may be useful to protect the choker from dirt. 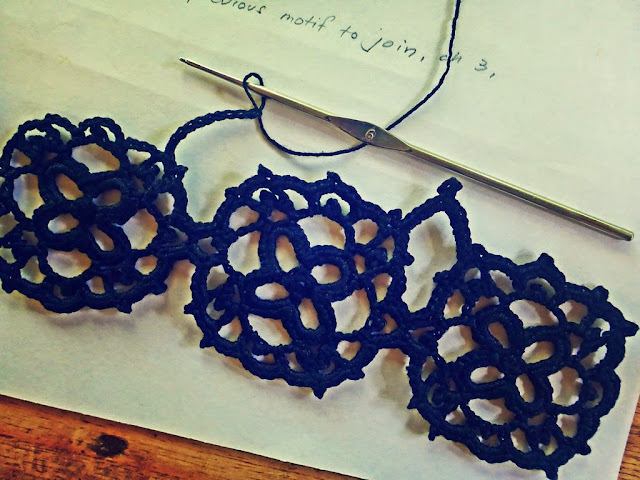 Starching may also bring out the finer textures of the crocheted piece. So it is up to you if you wish to starch your finished object. 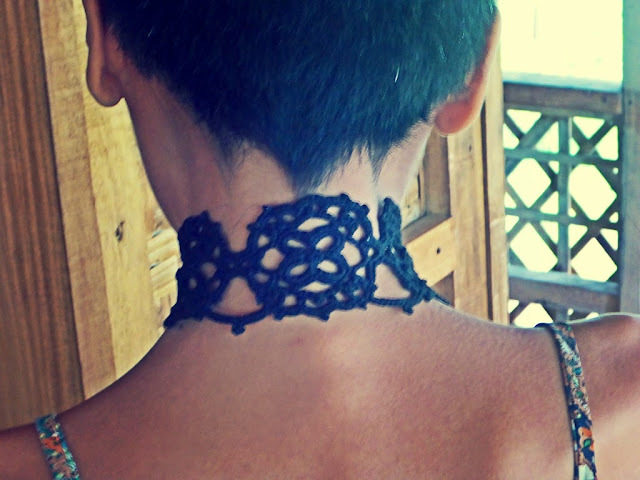 This choker is composed of motifs worked together. I used five motifs. You may use less or more as your measurement requires. 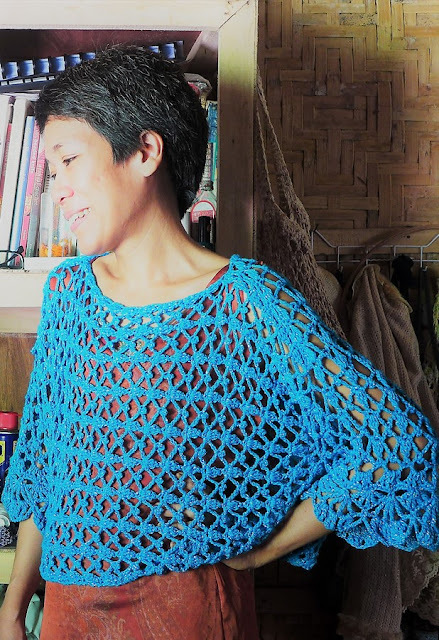 Please use suitable yarn for this design. I would recommend mercerised crochet cotton thread of size 8 or 10. 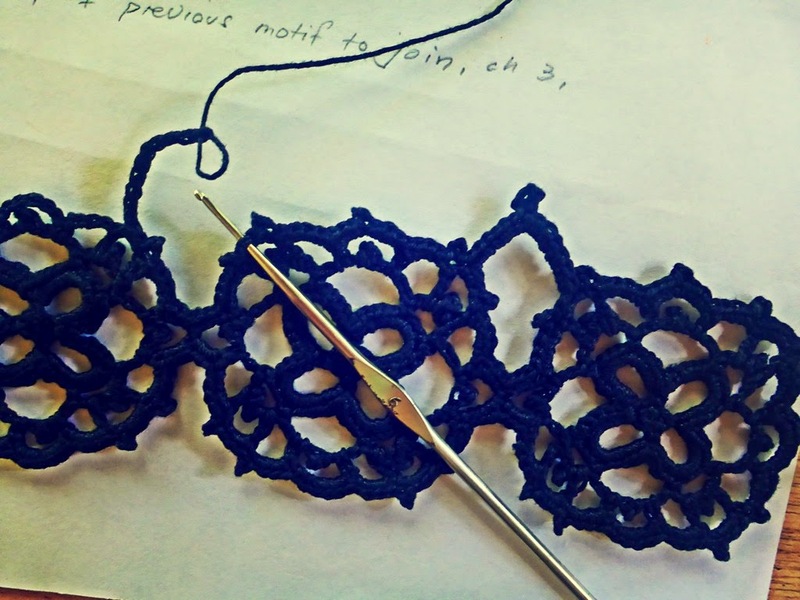 You may use finer thread to make smaller motifs for the choker. Use suitable hook for the thread. I used a 1mm hook for a choker made in size 8 black thread. 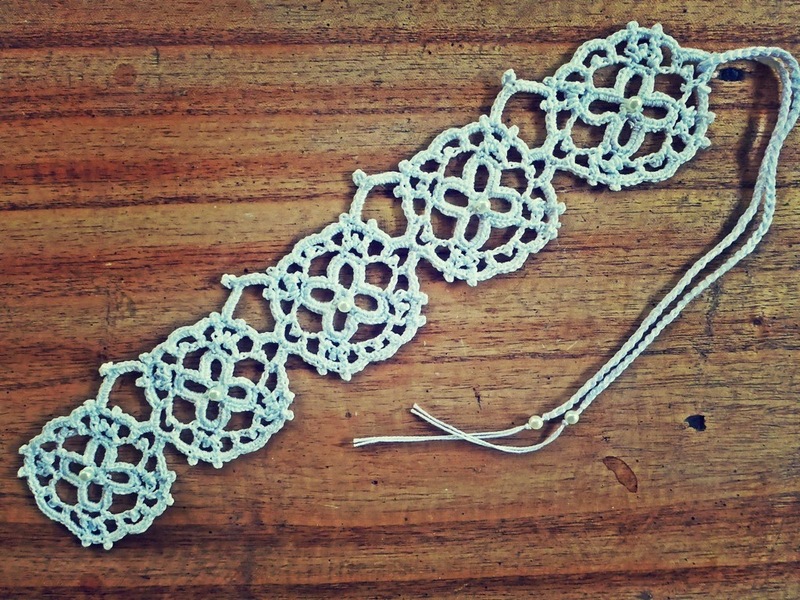 I found the same hook suitable for a choker made in size 10 white thread. Alter, modify the pattern to your liking. Along one side of the choker are 10-ch loops which you may disregard, or you might try putting those loops along both sides of the choker. Another alternative design might be to put the loops along half of one side and half of the other side of the choker, making a piece of asymmetrical design. 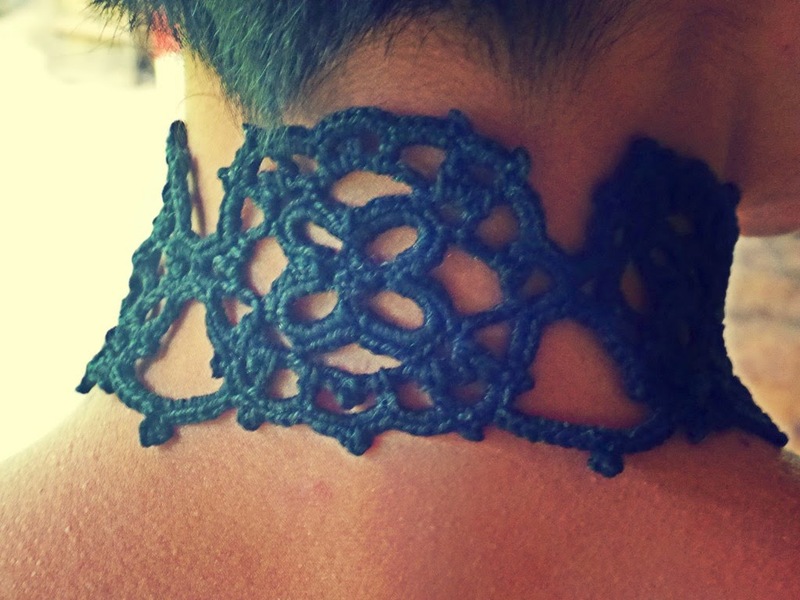 Embellish the choker as you wish. I added pearl beads to the white Angeluciene, which could make for a beautiful wedding jewellery. Experiment with combinations of colours of threads and beads. In this design, I present two methods of closure – a button or ties – which are decorative elements to the design. Experiment with your own variations. Make the choker in other colours of combinations of colour. This is white with pearl beads in the center of each motif. Picot: Ch 3, sl st in third ch fr hook, picot made. Rnd 1: Ch 2, 4 sc in first ch; sl st in first sc to join. Rnd 2: Ch 1, sc in first sc, *ch 7, sc in next sc; rep fr * two more times; ch 7, sl st in first sc to join. (4 7-ch loops). Rnd 3: Ch 1, 14 sc in each of 4 loops; end with sl st in first ch. Rnd 4: Sl st in each of next 5 sc, ch 1, sc in same sc, *ch 2, picot, ch 2, sk 2 sc, sc in next sc, ch 3, picot, ch 3, sc in fifth sc of next loop; rep fr * two more times; ch 2, picot, ch 2, sk 2 sc, sc in next sc, ch 3, picot, ch 3, sc in first sc made in current round to join. Rnd 5: Sl st in 2-ch sp, ch 6 (count as dc + 3 ch), *sk picot, dc in 2-ch sp, ch 4, sc in 3-ch sp, ch 6, sk picot, sc in 3-ch sp, ch 4, dc in 2-ch sp, ch 3; rep fr * two more times; sk picot, dc in 2-ch sp, ch 4, sc in 3-ch sp, ch 6, sk picot, sc in 3-ch sp, ch 4, sl st in first dc to join. Fasten off. Motif should measure approximately 5.5mm. Begin new motif and follow instructions for joining below. Rnd 5: Sl st in 2-ch sp, ch 6 (count as dc + 3 ch), *sk picot, dc in 2-ch sp, ch 4, sc in 3-ch sp, ch 6, sk picot, sc in 3-ch sp, ch 4, dc in 2-ch sp, ch 3; rep fr * two more times; sk picot, dc in 2-ch sp, ch 4, sc in 3-ch sp, ch 3, sl st in 6-ch loop of previous motif to join, ch 3, sk picot, sc in 3-ch sp, ch 4, sl st in first dc to join. Fasten off. Make 5 motifs and join as instructed above. Join thread with sc to 6-ch loop at end of last motif of choker; 8 sc in same loop, *4 sc in 4-ch sp, picot, 3 sc in 3-ch sp, picot, 4 sc in 4-ch sp, 6 sc in 6-ch sp, 4 sc in 4-ch sp, picot, 3 sc in 3-ch sp, picot, 4 sc in 4-ch sp, 3 sc in 3-ch sp, 3 sc in 3-ch sp of next motif; rep fr * all along edge of choker; make 8 sc in 6-ch loop at the other end of the choker. Continue to other edge of choker as follows: 4 sc in 4-ch sp, picot, 3 sc in 3-ch sp, picot, **4 sc in 4-ch sp, 3 sc in 6-ch sp, picot, 3 s cin same 6-ch sp, 4 sc in 4-ch sp, picot, 3 sc in 3-ch sp, picot, 4 sc in 4-ch sp, 3 sc in 3-ch sp, 3 sc in 3-ch sp of next motif, 4 sc in 4-ch sp, picot, 2sc in 3-ch sp, ch 10, remove hook fr loop and insert in middle sc bet 2 picots in previous motif, pull loop through, 6 sc in 10-ch loop, ch 5, sl st in last sc made, 6 sc in same 10-ch loop, 1 sc in 3-ch sp, picot; rep fr * all along edge of choker. Sl st in first sc to join. Fasten off. Sew button to one end of choker. Alternately, instead of a button, you may crochet ties for the choker. Remove the hook from the loop. Insert the hook into the single crochet between the two picots of the previous motif. Pull loop through. 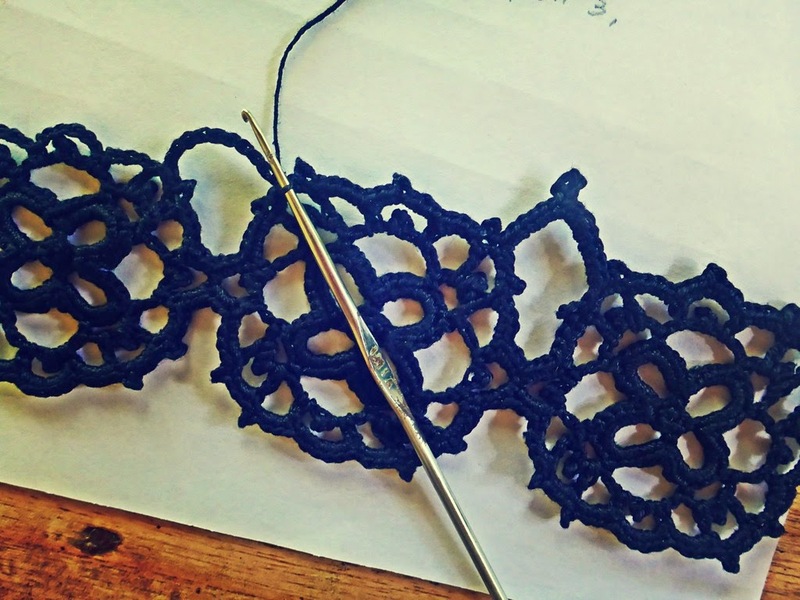 Make single crochet stitches in 10-ch loop as instructed in the pattern.